This is one of my last feature stories I did for Old Dominion as a full-timer there. It’s one of my favorites. And it’s an example of some of the brilliant young people who come through the university. I saw that all the time. Stunning talent, achievement and potential in this world. Thanks for checking it out. The half-dollar tumbled across Josiah Emery’s knuckles like a brook over pebbles. It disappeared into his right palm, then bucking gravity, shot up into his hovering left palm. Desperately trying to follow Emery’s steady patter and slick fingerwork, an observer was dazzled moments later to see Emery’s hands empty – and the coin perched on the observer’s shoulder. Emery flashed a Cheshire smile through his bushy beard. 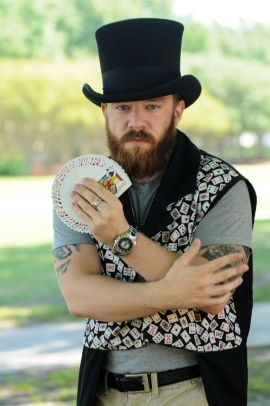 For his next trick, Emery will graduate from Old Dominion University on May 6 with bachelor’s degrees in mechanical engineering and applied mathematics. Emery regularly performs coin, card and balloon tricks at events like birthday parties, after proms and even before Monarch football games, where his mother, Christine, is a face-painting clown on Kaufman Mall. Emery picked up the entertaining bug from her as a child, but as a magician and balloon artist he is mostly self-taught. And accomplished. Emery proudly shows off a thick photo book of his balloon animals and other figures, including his masterpiece, an intricate Star Wars X-Wing fighter plane that took him eight hours to complete. Looking forward, Emery will proceed in his quest to become an aerospace engineer at Georgia Tech beginning in August. The university awarded Emery a full scholarship and a $26,000 annual stipend to be a research assistant. The valedictorian of his class at Churchland High School in Portsmouth, Emery entered Old Dominion with numerous Advanced Placement and college credits. He took two levels of calculus as a high-school junior and other advanced math at Tidewater Community College before arriving at ODU. When he completed the requirements for his mechanical engineering degree in three years, Emery, whose father, Brian, is a retired Coast Guard warrant officer, added math as a second major. In his “free” time, Emery is a ravenous reader – the classics to superhero comic books to a tome on math’s “millennium prize problems” – and an active tutor. He noticed that the campus lacked an undergraduate tutoring lab for mechanical engineering students, so he helped start one. “Josiah is an example that Old Dominion engineering gets top-end students on the same par as anywhere,” said Colin Britcher, professor of mechanical and aerospace engineering. Emery does that not only by being academically brilliant, Britcher said, but by modeling enthusiastic communication skills. It’s only natural, because his act requires a steady stream of stage banter. That engages his audience. But it also distracts observers so that they never notice, for example, the half-dollar when it leaves Emery’s hand and winds up on their shoulder. Emery’s intellect, eager curiosity and outgoing personality lead him to find fascination – even magic — in most anything he thinks about.